Gay Pride Parade in Dublin last year. TODAY IS PRIDE Day – the epicentre of the celebration of the gay community, and an opportunity to discuss any obstacles in equality that still may need to be overcome. 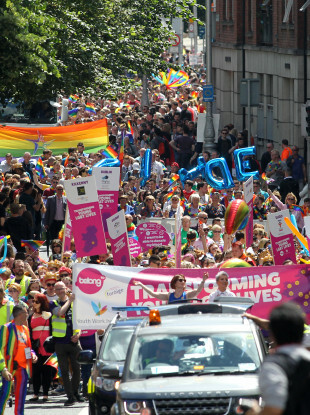 This weekend, Ireland’s biggest Pride celebration gets underway in Dublin. Other gay Pride celebrations are due to take place in Cork, Galway, Limerick, and Newry later this year. The weather forecast is looking good for today – temperatures could hit the mid 20s and it’s going to stay dry all day (though it could be cloudy in parts). We’ve put together a short guide of what will be going on where – starting with the main parade in Dublin city centre. People will begin gathering at St Stephen’s Green South from 11am – the parade will begin moving at 2pm sharp. A pre-parade rally will take place from midday at St Stephen’s Green South, where you can also enjoy the floats before they get going. The parade itself will travel along Cuffe St, Kevin St, Patrick St, Nicolas St, High St, Bridge St, Church St and North King St before finishing at Smithfield Square. If you’re attending restricted areas for Pride, there are some security requirements you’ll have to meet. You’ll only be allowed to carry bags smaller than A5 size (that’s half an A4 sheet). All bags will be searched, and alcohol isn’t permitted. Restricted Pride areas include St Stephen’s Green South and Smithfield Square. Haymarket in Smithfield will be closed between 6am and 10pm. In both cases, pedestrian and local access will remain open. 13, 27, 40, 44, 49, 54a, 56a, 61, 77a, 83/a, 123, 150, 151, 747 and the Hop On/Off City Tour. Last year around 30,000 people attended Dublin’s Pride parade, and there were over 60 floats – so expect even more this year. In 1983 Dublin’s first Pride parade took place, marching from St Stephens Green to the GPO on O’Connell Street. Email “Dublin Pride is on today - here's all you need to know”. Feedback on “Dublin Pride is on today - here's all you need to know”.